Works great with our entire ‘Stand Tall’ range! !﻿Being tall is a desirable attribute for many people. 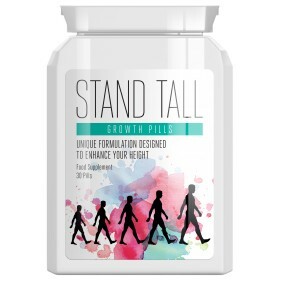 ‘Stand Tall’ Growth Pills contain a unique formulation designed to enhance your height. The growth pills are a safe and natural way to quickly and permanently increase your height. The unique formulation begins to work instantly, encouraging growth naturally. The powerful ingredients work hard to stimulate bone, muscle and cartilage growth, enabling your height to steadily increase. • Safe & natural way to permanently increase your height! • Ingredients to stimulate bone, muscle & cartilage growth! • Begins to work instantly, encouraging growth naturally! • 100% natural and safe! No need for surgery! ‘Stand Tall’ products will increase your height and ensure you grow taller! • Products formulated using 100% safe & natural ingredients! • Products are tested & developed alongside an expert team! • ‘Stand Tall’ products guarantee great results, fast! • We guarantee the best expert quality results! Stand Tall Growth Pills contain a unique formulation which will increase your height quickly and permanently. We have many happy customers who have grown up to 3-6 inches. The unique formulation contains ingredients that will stimulate bones, muscle tissue and cartilage growth ensuring your height will rapidly increase. Stand Tall growth pills are 100% natural and safe to use, with no side effects.